An invitation from two moderators of a Facebook group that I am a member of had totally slipped my mind. But their reminder that day hastened me to get ready and rush to downtown to meet these out-of-town guests. 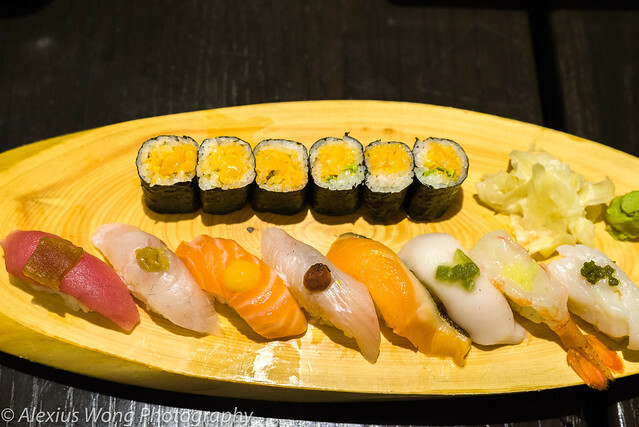 Furthermore, the choice of location was perfect as I had been wanting to taste and write about the sushi offerings at Kaz Sushi Bistro since I had been eyeing it for many years, but never had the chance to step through its doors. Walking in, you sense the sleek minimalist decor and furniture, modern but not too stuffy or fussy. The space is quite crammed, much like stepping into a restaurant in Tokyo, thus lending a Japanese ambiance but in a modern sense. We quickly navigated through the menu which was quite familiar and well-designed for the hungry eyes. After ordering, we started off with a bottle of sake. 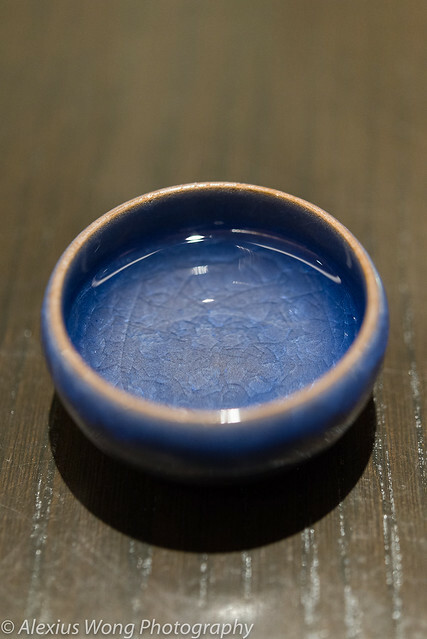 Our waitress brought us an array of fine Japanese porcelain to choose from, which was an exquisite touch. One sip of that rice wine sent my taste-buds on high alert as I immediately recognized its refinement and superior quality by its smoothness and hint of fruit-like finish. For $70 a bottle, I guess one shouldn’t expect any less. One of our starters was Cucumber and Smoked Mackerel Salad. 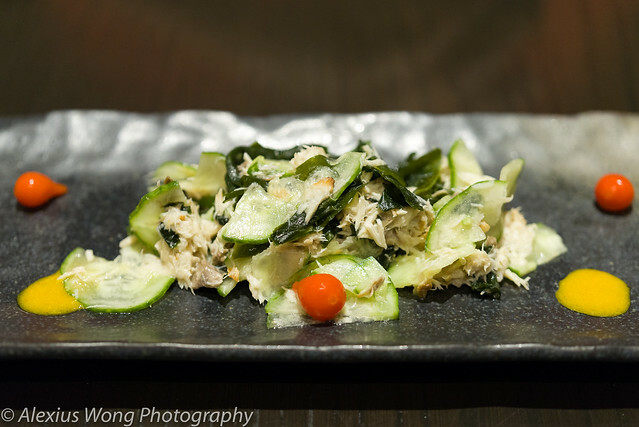 The beautiful plate arrived with the marinated vegetable interspersed with flakes of smoked mackerel and bands of wakabe seaweed. It was an interesting combination of sweet and sour flavors as well as textures. The smokiness from the fish was not overpowering as it acted as a foil to the other flavors. The accouterments of red mini chilies were a sensational pop as well as the dabs of Japanese mustard, akin to the English one but sweeter, that added more bold flavors to the mix. This dish was already sending me the first road sign of the direction that the meal was heading towards. The other appetizer was Jicama and Seaweed Salad. 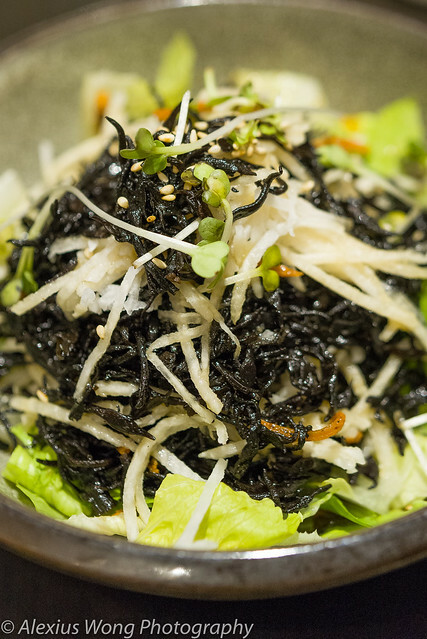 The bowl arrived with thin julienned strips of the jicama root, a dark seaweed, sesame seeds, lettuce, and microgreens. I enjoyed the combination of the slightly sweet crunchy jicama together with the seaweed that exuded its iodine sea aroma. The dressing was a light sweet and sour combination that did not overwhelm, but it was too similar to the above salad; a different flavor profile of the dressing would have made this dish a perfect accompanying partner to the above order. Now, Sushi Time. My friends decided to go a la carte and I chose a set plate from the chef’s special menu. Their order looked beautiful not only by the visuals, but I sensed the quality and the proper treatment of the seafood pieces just by their appearance. However, I did not try a piece and relied solely on their sense of contentment while they were eating them. My order was the Chef’s Sushi 009, as it was highly recommended by our waitress. Each sushi piece was not only a different piece of seafood, but they were adorned with flavor elements comprising of Japanese mustard, citrusy yuzu, green peppers, yuzu-marinated tapioca pearls, flavored jelly, and salted plum. These elements added an individual personal kick to each bite that were bold and exciting without overwhelming the delicate seafood; even the pickled ginger was saltier and stronger than usual. 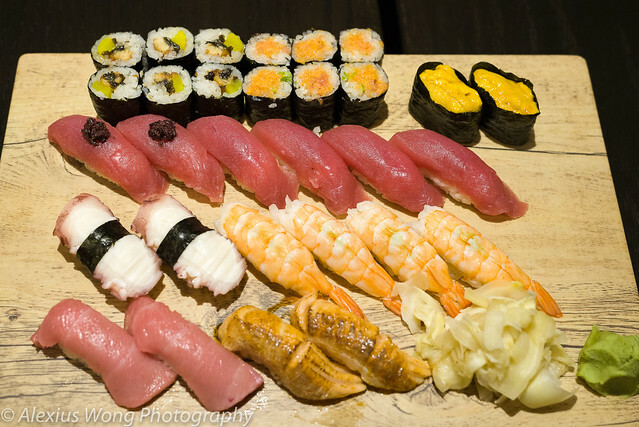 I enjoyed each bite for their flavor “personality” in addition to their exceptional quality that made it a truly remarkable sushi experience for me. Just when we thought we had enough, my gracious friend ordered a couple of desserts. 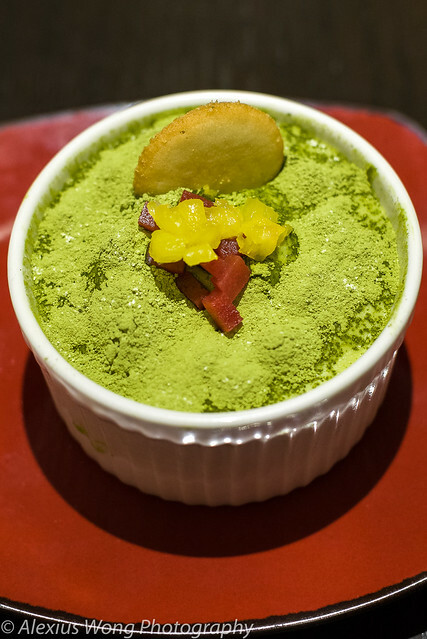 The first was Matcha Green Tea Tiramisu. The cocotte arrived with a topping of green tea powder and brunoise of fruit. Underneath was a moist and luscious rich cake that was balanced by the slightly bitter tannin of the tea powder that spoke of healthy antioxidants to dampen some of the guilt from the cake; I appreciated the tea powder that reminded me of a fresh cup of quality green tea that I have drunk before. The pieces of fruit were well macerated and they lent some light fruitiness to the whole mix, making this a truly decadent yet not overwhelming sweet. 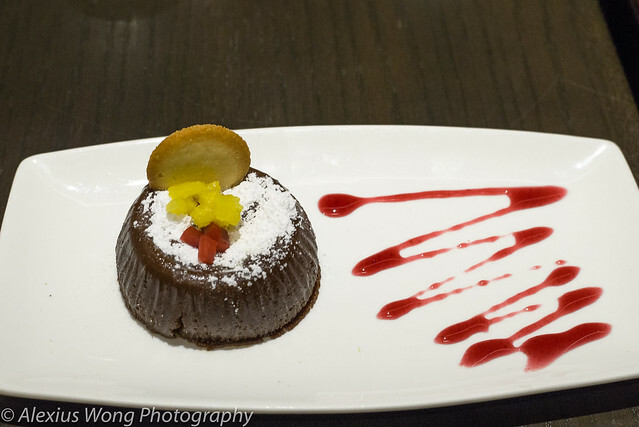 The other dessert was their version of Molten Chocolate Cake. Despite sitting on the table for some time as we were engrossed in our conversation, it oozed out its goodness onto the plate when we cut into it, an indication of it being perfectly cooked. Each mouthful exuded its rich dark chocolate flavor with a smooth mouthfeel from the use of butter. The side raspberry coolie was not perfunctionary since it was concentrated with a good tanginess in each drop that rivaled the strong chocolate. Despite having eaten two rich and excellent desserts, we were adequately sated without feeling overindulged. My meal at Kaz Sushi Bistro was a superior experience that confirmed my hunch, as well as other reviews, of this establishment. The ambiance was inviting and polished with a wait and sushi staff (complementary aperitif from the sushi chef) that are charming and personable without being intrusive. The seafood was of exceptional quality that was treated with differentiated flavors that were creative yet true to the cuisine with bold flavors that matched the delicate pieces. As for the desserts, they did not play second fiddle as they were made to impress the diner at every level. Price-wise, I think that this level of dining was well-priced and worth the extra for the quality of seafood and the dining experience one gets here. I would easily return here to re-experience this level of fine dining.